Head of Khuzestan Public Health announced emergency conditions in Ahwaz due to heavy pollution and all citizens are recommended to stay at home. On Saturday February 20 Shokrollah Salmanzadeh told ISNA that dust particles in Khuzestan air have put the cities under warning. The warning is issued not only to vulnerable groups such as those suffering from respiratory complications but even healthy individuals. 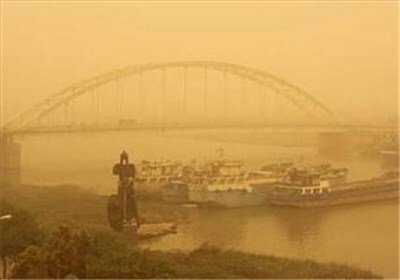 Dust particles in Khuzestan air has been a serious problem in recent years especially affecting the lives of its citizens especially in Ahwaz where on some days visibility is completely lost and city life brought to a halt by the pollution. Last November the dust particles and acid rain killed one and send another 110 citizens to the emergency in Ahwaz. The dust storms reportedly originate in North Africa and Western Asia due to the changes in the regional landscape by climate change and persistent war and conflict in the region.